Genome medicine uses genomic information in the diagnosis of disease and in prescribing treatment. This transdisciplinary field brings together knowledge on the relationships between genetics, pathophysiology and pharmacology. Systems pharmacology aims to understand the actions and adverse effects of drugs by considering targets in the context of the biological networks in which they exist. Genome medicine forms the base on which systems pharmacology can develop. Experimental and computational approaches enable systems pharmacology to obtain holistic, mechanistic information on disease networks and drug responses, and to identify new drug targets and specific drug combinations. Network analyses of interactions involved in pathophysiology and drug response across various scales of organization, from molecular to organismal, will allow the integration of the systems-level understanding of drug action with genome medicine. The interface of the two fields will enable drug discovery for personalized medicine. Here we provide a perspective on the questions and approaches that drive the development of these new interrelated fields. Our knowledge of the mechanisms by which drugs act physiologically advanced radically during the twentieth century. With the advent of biochemistry and molecular biology, the targets of drugs became increasingly well characterized. The development of receptor theory by Clark  and Black [2, 3], followed by analyses that distinguished between competitive and non-competitive inhibition, began to shed light on the mechanisms by which drugs worked at the molecular level . The influence and relevance of receptor theory in modern pharmacology is derived from the large number of drugs that target membrane receptors, the majority of which are G protein-coupled receptors (GPCRs). The theory of enzyme kinetics led to substrate-based inhibitor design of drugs. These theoretical underpinnings, the size of the market for specific classes of drugs and the ease of drug design for a proven target have resulted in many similar drugs that can target a single protein. ACE inhibitors that are used to treat hypertension are good examples of this approach. The drug pipeline has evolved, with the appearance of targeted therapies and biological therapeutics, such as monoclonal antibody therapies. Many diseases, such as hypertension, ulcers and several types of cancer, that could not be treated two generations ago, can now successfully be managed, if not cured. Yet the 'drugome' (the proteins and genes that are targeted by drugs approved by national regulators such as the US Food and Drug Administration, FDA) covers only a small fraction of the proteome or the 'diseaseome' (genes that have been linked with disease), and many drugs are focused in just a few areas (Figure 1) [5, 6]. This disparity reflects the current relationship between basic biological science and its use for therapeutic purposes. There are substantial opportunities to use the accumulated knowledge of biological processes for drug discovery and clinical applications. If we are to take advantage of such opportunities, genome medicine and systems pharmacology need to be well integrated. Relationships between the genome, proteome, diseaseome and drugome. The number of distinct protein species (about 400,000) comprising the proteome (green circle, scaled down by 25% relative to the other circles), is estimated by taking the approximately 25,000 currently annotated genes (yellow circle) and assuming about four splice variants per gene and about four post-translationally modified proteins per splice variant. The genome, diseaseome and drugome form a Venn diagram. The red circle represents the approximately 1,800 genes known to be involved in various diseases (the diseaseome). Of these, a small fraction (the drugome) is targeted by FDA-approved drugs. Not all drug targets have been characterized as disease genes. In total, proteins encoded by approximately 400 genes (0.1% of the proteome) are targeted by about 1,200 FDA-approved drugs. There are more drugs than protein targets because more than one drug can target the same protein. As the systems-level understanding of biological processes expands, it is becoming a crucial driver of pharmacology that is anchored in the human genome and personalized medicine. The path from laboratory research to clinical application is becoming short as translational research grows, facilitating collaborations between basic researchers and clinicians. Genomic and proteomic technologies drive discovery of biomarker sets for the classification of diseases and the stages of their progression, as exemplified by microarray-based marker sets that have been developed to identify stages of cancer progression [7, 8]. Although more of these approaches need to be discovered and then standardized before they are routinely used in clinical practice, the importance of using systems-type methodologies to characterize therapeutic interventions, to delineate the pathways (or more often networks) involved in disease, and to identify the mechanisms of action and off-target effects of current drugs is becoming clearer. A multi-faceted understanding of therapeutic intervention is necessary, given the complexity of human physiology and the increasing availability of numerous clinical parameters and analyses. Here, we explain the reasoning underlying the assertion that systems-level knowledge of pharmacology and pathophysiology, rooted in genomic information, will increase the efficacy of existing drugs by aiding in the development of personalized medicine and will facilitate the rational discovery of new drugs using a much wider target base. For pharmacology to be understood at a systems level, it is necessary to use a genome-based approach to systems-level studies of physiology and pathophysiology. An operational definition of genome medicine is the way in which genomic information from a patient helps in the diagnosis or treatment of disease. This includes areas such as the genetics-based diagnosis of the origin of diseases, their progression and the response to drugs. In the area of drug response, genome medicine overlaps with pharmacogenomics, a field that studies how genome variation affects drug response. It is well established that some diseases arise from mutations in single genes and can be treated using the wild-type product from that particular gene. Fabry's disease is an example of such a monogenic disease [9, 10]. However, it is now known that many complex diseases arise from interactions and changes in multiple genes. The two-hit model for cancer  was an early example of this recognition. Mapping of genetic variations, such as single-nucleotide polymorphisms (SNPs), in the human genome has given rise to the idea that combinations of variant genes can alter susceptibility to various diseases. Genome-wide association studies have become popular over the past few years , although their ability to predict disease susceptibility is only beginning to be determined. Nevertheless, it is clear there is sufficient genomic variation between individuals to affect the origin and progression of diseases, as well as drug response. For example, genetic testing for cancer drugs, such as imatinib [13, 14], trastuzumab , gefitinib  and bucindolol , provides information about whether the form of the protein target that is expressed in each individual will be responsive to the drug. Testing for the gene BRCA1 is used to determine the feasibility of preventative measures for breast cancer . Other types of genetic testing are more pharmacogenomic in nature, such as those for warfarin [19, 20] or tamoxifen . These tests screen for polymorphisms in distinct cytochrome P450 isoforms, which are responsible for differences in how the drug is metabolized and thus affect the therapeutic index, the ratio between the toxicity and effectiveness of the drug. Pharmacogenomics can thus be considered to be a very important part of genome medicine. Recent views on pharmacogenomics describe in greater depth the relationship between genomics and drug response [22, 23]. Our understanding of a patient's genome will increasingly drive medical practice in the 21st century. The development of technologies for rapid sequencing of whole genomes is an important factor in this changing approach to medical practice. The growing number of treatment options for pathophysiology, and the accumulation of knowledge about the risk-to-benefit ratio of prescribing one therapy over another when anchored in individual genomic information, should allow the individualized tailoring of therapies. Such tailoring would be based on an individual definition of the therapeutic index of a drug for a specific individual. Currently, many clinical practices are based on empirical trial-and-error approaches, and drug usage typically follows a 'one size fits all' approach. Even for diseases for which therapies have been very successful, we generally do not understand why one type of therapy works for one individual and not for another. For example, there are four general types of therapy to treat hypertension (thiazide-based diuretics, angiotension converting enzyme inhibitors or angiotension II receptor blockers, calcium channel blockers and β-adrenergic receptor blockers or beta-blockers) . There is relatively little predictability as to which hypertension treatment will be more effective for any given patient, and there is a large patient-to-patient variability in response to each therapy and required dosage. Current data suggest that 50% of patients who do not respond to one type of therapy will respond to another and that 70-80% of patients will respond if switched for a second time to yet another type of antihypertensive drug . The characterization of all of the hypertension-related genes in the patient's genome may facilitate the construction and systems-level analyses of the regulatory networks, using those hypertension-related genes as seed nodes. From the physiological functions of these networks, we may be able to identify the pathways involved in disease of an individual to predict the action of a drug. Such personalized disease networks for patients would allow clinical practice to move away from a trial-and-error approach to prescribing drugs and to advance to a more genome-informed disease management. This type of clinical practice could easily be called 'genome medicine'. Although the state of the genome will be a major determinant of how diseases originate and progress, it is unlikely to be the only cause in many cases. Environmental factors also have an important role. In many cases these two factors are related, whereby a particular genotype changes the risk of an environmentally induced disease. This relationship can be understood by considering the biochemistry and physiology of the system. Genes are most often transcribed and translated into components of biochemical networks that underlie cellular processes. Often there is more than one type of change in a particular gene; some of these types of change lead to a change in the function of a key cellular component and ultimately to a disease state, whereas others are inconsequential. Sometimes, even if a mutant gene product behaves aberrantly at a biochemical level, this behavior can be compensated for and the physiology remains normal. Alternatively, the aberrant behavior of diseased cells might not be only genetic in origin but also a result of changes in normal cell signaling processes that regulate transcription, translation and effector protein function. The hypothesis that inflammation underlies the origins of several diseases, for example, is based on the assumption that the normal process has gone awry because of environmental signals, resulting in sustained activation of intracellular signaling networks that results in pathophysiologies. There is accumulating evidence to support this hypothesis [26, 27]. The effects of post-transcriptional and translational regulation of signaling can increase the difficulty of developing methods for individualized mechanism-based therapeutic interventions. A systems understanding of disease and drug action at the level of cellular biochemical reactions and physiological function would be useful in framing the effect of genomic variations in the context of environmental cues. This is where systems pharmacology comes in. Systems pharmacology seeks to develop a global understanding of the interactions between pathophysiology and drug action. To develop such an understanding it is necessary to analyze interactions across and between various scales of organization. The representations of different scales are illustrated in Figure 2. The biological insights gained from multi-scale analyses of physiological processes have been noted previously [28, 29]. Analysis of such multi-scale systems requires one to 'zoom' in and out depending on the type of analysis being conducted. During the process of multi-scale analysis (zooming), it is essential that we develop a mechanistic understanding of the relationships across the various levels. Simply correlating structural information or molecular interactions with clinical phenotypes is a good starting point, but it will not yield the ability to predict disease progression or drug treatment outcomes. The type of 'system' to be analyzed can vary depending on the zoom level (Figure 2) of information desired. The system can be considered at the organismal, organ, tissue, cellular or molecular levels. The effects of a drug on pathophysiology that are seen at the organismal level, that is, symptoms or clinical measurements, are zoomed-out observations. These observations usually consist of clinical data, ranging from blood chemistry to measurements reflecting organismal function, such as blood pressure and stress tests, all of which are documented in the electronic medical records of the patient that will aid future computational analyses across scales. Multi-scale analyses in systems pharmacology. The top half of the figure is a schematic representation of different scales of organization involved in human pathophysiology and systems pharmacology. Clinical indicators and analyses (left) indicate measurements of various types of blood concentrations, blood pressure, stress and so on; these parameters are available in the electronic medical records of patients. From left to right, the scale becomes smaller, or 'zoomed in'. The human body (or organism) can be analyzed at the levels of organs, tissues, cells (represented here together with tissues) or molecules. Drugs are prescribed and taken at the organismal level but exert their effects by interacting with their target at the molecular level (red arrow). The gradient from white to blue corresponds to the various levels of interaction systems: white represents a clinical setting; blue represents a laboratory setting. Studies in systems pharmacology fully span all levels shown here. The physiological responses to a drug or disease are manifestations of events that can be studied at zoomed-in perspectives. Emerging imaging technologies are complementing pathology to observe disease progression and treatment outcome. The entire network of events that are involved in therapeutic intervention can be analyzed in proteomic or genomic studies, or, at a more detailed level, specific protein-protein interactions or enzymatic reactions can be examined. Much of the zoomed-in systems pharmacology understanding comes from basic laboratory research. The methodologies available to address the questions across zoom levels include biochemical experiments, microarray and other high-throughput methodologies, animal models and computational modeling and analysis of molecular and cellular functions. Generally, a systems approach that integrates knowledge from analyses across multiple zoom levels is likely to uncover a new target in a pathway of interest, or the basis for an observed adverse effect, that would probably not have been discovered using traditional techniques. In order for a discovery made at the molecular or cellular level to be applicable clinically, the effect must be demonstrated at the organ and organismal levels and established to be applicable to a population. Thus, systems pharmacology uses a range of approaches that spans multiple scales of organization, as is shown in Figure 2. The different areas of study in systems pharmacology and their relationship to genome medicine are briefly discussed below. 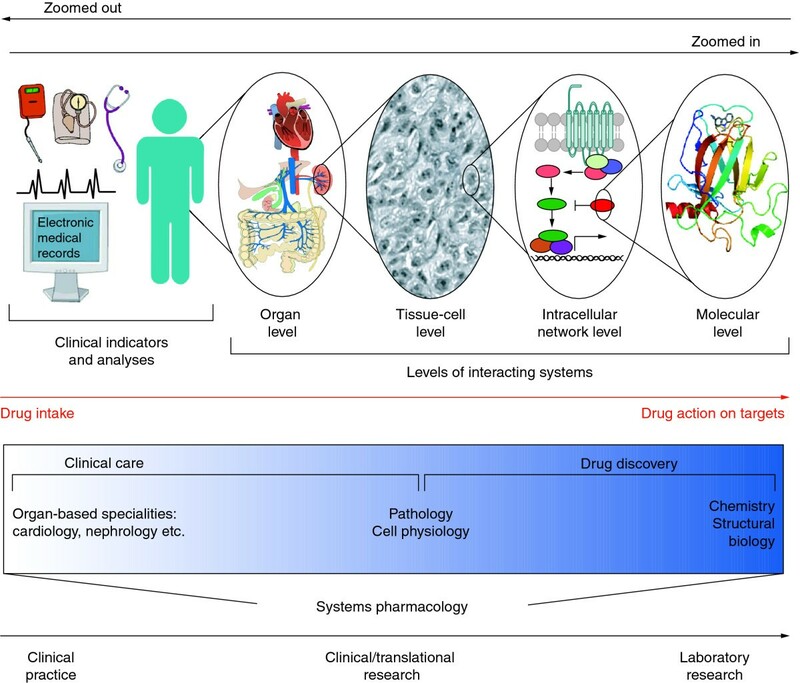 Research in systems pharmacology integrated into genome medicine tends to follow two directions: the 'physiology to therapeutic intervention' direction (bottom-up) comprises approaches that facilitate new drug or drug-target discovery; and the 'therapeutic intervention to physiology' direction (top-down) focuses on the characterization of current drugs across scales of interactions in terms of their mechanism of action, off-target effects or similarity to other drugs. Studies in the bottom-up direction include network analysis, which provides a foundation for systems pathophysiology. 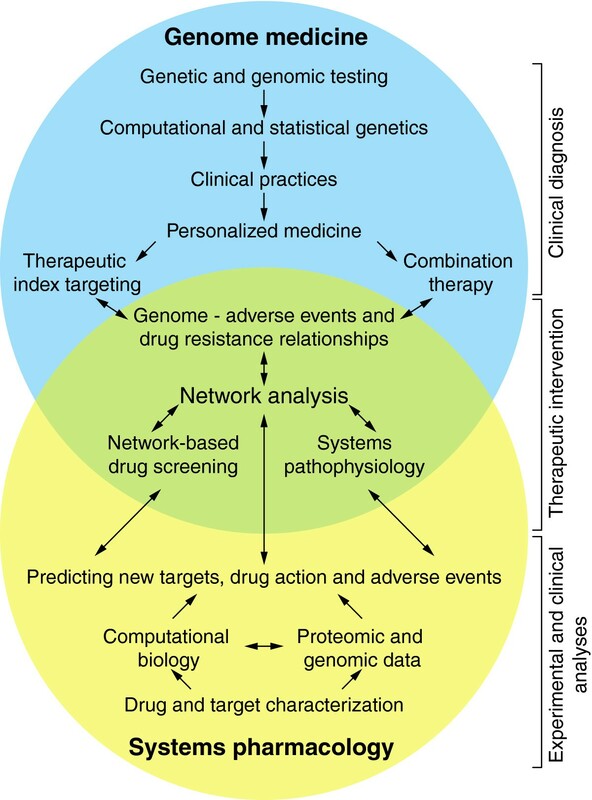 Network analysis can be used to identify new targets for therapeutic intervention and to understand adverse events and drug resistance from genomic information. Bottom-up analyses are based on the integration between systems pharmacology and genome medicine (Figure 3). The bottom-up approach can be complemented by top-down studies and include analyses of networks at various levels to study the effect of a drug on a system, commonalities among drugs (global analyses of the 'drugome'), drug resistance and effects of drug combinations. The relationship between genome medicine and systems pharmacology. The diagram summarizes various aspects of genome medicine (in blue) and systems pharmacology (in yellow). Overlapping aspects of analyses and practice are in green (intersection of circles). The positioning of the circles indicates the operational classification of 'genome medicine to systems pharmacology' as top-down and 'systems pharmacology to genome medicine' as bottom-up. The key analyses and practices are in the circle for the field that uses them. Approaches and practices that are used in both fields are in the overlapping region. Genome medicine starts with genetic and genomic testing. Experimental data are computationally processed using statistical genetics tools to yield information that is used in personalized medicine for therapeutic-index targeting (such as dosage of warfarin) and combination therapy. Network analysis is a common approach that integrates genome medicine and systems pharmacology. Systems pharmacology starts from cataloguing the characteristics of individual drugs and targets from biochemistry and cell-physiology experiments. Computational methods and genomic and proteomic data together enable the use of this catalog of information to make predictions regarding drug discovery, drug action and adverse events. Such predictions can be experimentally and clinically tested. Approaches common to both genome medicine and systems pharmacology are based on network analyses that underlie systems pathophysiology, whereby the origins of disease are understood in the context of multi-scale systems. Such understanding enables network-based drug screening and whole genome-based predictions of adverse events and drug resistance. Thus, ultimately, therapeutics intervention will be guided by integrating genome medicine and systems pharmacology. Many efforts to systematically understand the cellular processes involved in disease lead to sets of proteins that are mutated to become under- or overactive, deleted, over-expressed or aberrantly post-translationally modified in the disease state. Genomic and proteomic studies can be designed to globally screen for cellular components that stand out in the disease model. Subsequent small-scale studies often focus on verifying one or several of the predictions from the large-scale screen. In order to obtain a multi-faceted analysis, techniques such as RNA interference (RNAi) screens, gene-expression profiling, chromatin immunoprecipitation (ChIP) analyses or protein micro-arrays are combined. Analyses on patient-derived samples allow data from humans to constrain and validate animal or cell models of disease. Approaches such as these have been applied to cancer [30–32], malaria , heart failure  and HIV [35, 36]. 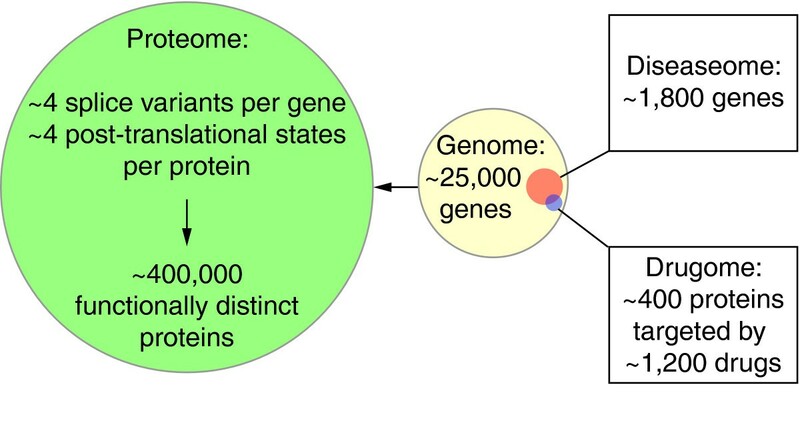 These global analyses to identify genes, proteins and other cellular components related to the origin or progression of a specific disease yield lists of 'seed nodes' that can be used to computationally construct disease networks by integrating knowledge about protein interactions reported in biomedical literature. With additional experiments or analyses, it becomes possible to place seemingly unrelated proteins in the context of a pathophysiology and thus to explore whether they are potential therapeutic targets or biomarkers. The use of a network of known pathways surrounding genes with annotated cardiovascular involvement, for example, enabled the identification of a series of mass spectrometry biomarkers for major adverse cardiac events . Similarly, a network-based approach was able to identify sets of interactions between nuclear receptors and insulin signaling-pathway proteins related to type 2 diabetes . Identification of previously unrelated relationships between disease pathways and cellular functions is a first step in identifying drug targets. The accumulation of published systems-level datasets related to drug action calls for new ways to compile the data into a computable format. An example of this type of effort is the Connectivity Map , which finds correlations between gene-expression signatures and the sets of proteins involved with the action of a class of drugs or with a particular disease. Although the correlations found through the Connectivity Map approach are an excellent starting point to gain insights into how the gene-expression signatures indicate aberrant cellular or physiological behavior, more detailed mechanistic studies are necessary to develop predictive capabilities. Even at the level of a single protein, a systems-level understanding becomes useful. A mutant protein implicated in disease can have multiple changes in its behavior in the network. These changes must be put into the context of the disease 'system' in order to determine which property has the highest impact. Different mutations in the small G protein Ras, which are found in many cancers, increase Ras activity by several different mechanisms . To understand which mutation has a more important role in oncogenesis, the effect of two mechanistically distinct Ras mutations on the entire downstream signaling network was analyzed computationally and the results were confirmed experimentally . The computational model predicted that a drug that specifically binds GTP-bound Ras will have a more specific effect on the mutant than it will on the wild-type system, and thus also on cancerous than on normal tissue. Such a prediction could not have been made by simply correlating mutations with disease phenotype. Thus, a systems understanding of a single protein function in a disease signaling network can predict new targets for therapeutic intervention in a mechanism-based manner. Direct relationships between diseases, drugs and proteins enable statistical inferences about less obvious relationships between them. Global analysis of FDA-approved drugs has found that, unlike ubiquitously expressed essential genes, drug targets tend to be expressed in specific tissues yet tend to interact with many other proteins in the cellular network while being independently regulated [5, 6]. A bipartite graph of 1,052 FDA-approved drugs interacting with 485 targets contained 179 'islands' (sets of nodes that are not connected to any other node in the graph). Most of these islands are made up of 10-30 interacting cellular components. A single large island of 481 components consisted of drugs that target GPCRs . This large island exists in part because of the many physiological processes, as varied as cardiac contractility, acid secretion and airway constriction, that are regulated by GPCRs, and in part because the extracellular ligand-binding domains of these receptors make ideal drug targets. Many drugs target GPCRs and, despite the physiological diversity of these proteins, all GPCR-mediated signaling is coupled through heterotrimeric G proteins. Commonalities of signaling mechanism among existing drug targets, such as this, create a basis for identifying what network properties make a protein a potentially good drug target. Statistical metrics from network analyses, such as a centrality measure, which quantifies the relative importance of a protein in communicating between different modules within a network, have been suggested for identifying nodes (proteins in a network) that have attractive properties as potential drug targets . Recent work has generated a network connecting drugs on the basis of their structural similarity and similarity of side-effect profiles . This method has been proven effective at identifying groups of drugs that share common targets. When drugs with predicted shared targets did not in fact have known targets in common, the predictions provided a framework for testing these drugs for binding against each other's targets. Hence, this approach led to the identification of new targets for existing drugs. Studies on cellular signaling pathways and networks drive systems pharmacology because they can lead to discoveries that enable new therapeutic interventions. These networks are often based on genomic information. Network analysis integrates genome medicine and systems pharmacology, as is shown by its central location in the overlapping part of the Venn diagram in Figure 3. Proteomic and genomic studies have increased dramatically in the past five years, and datasets describing global behavior, such as genomic or proteomic analyses of many cellular pathways and processes, are now available . These data expand our knowledge of signaling pathways by implicating many more signaling molecules, which may serve as new drug targets or have implications for drug resistance or off-target effects. Certain proteins or protein families are targeted more frequently in therapeutic interventions than others, because of their involvement in disease and the straightforwardness of designing drugs to target the proteins . Systems pharmacology studies on these systems are usually more common. For example, there are at least eight different approved or pipeline drugs that target one or several members of the ErbB family of receptor tyrosine kinases, which are modified in many kinds of cancer and other diseases . There are also many studies that computationally model [47–52] or experimentally analyze [51, 53–56] the dynamics of the ErbB signaling network. For example, the ErbB network has been analyzed by examining the interactions between the known phosphotyrosine interaction domains (PTB and SH2 domains) and phosphopeptides representing the phosphorylated forms of the four ErbB family members using microarrays . This study  uncovered behavior of the ErbB network that is pertinent to its role in oncogenesis and the implications of therapeutically modulating this family of receptors. Network analysis has facilitated the development of computational prediction algorithms that predict all possible molecules affected by specified perturbations of upstream targets by hypothetical drugs . These algorithms can also solve the 'minimum knockout' problem by yielding predictions of the smallest number of drug targets needed to fully block a cellular process . A similar computational framework for identifying targeted disruption of signaling networks allows identification of all sets of potential drug targets to block a process, while not affecting other processes . These types of network analysis suggest that computational analyses of cell signaling networks are likely to be an important aspect of systems pharmacology and future drug discovery . Most studies that focus on understanding resistance to therapies are in oncology. Many cancer therapies, such as microtubule stabilizers , tamoxifen or endocrine therapy  and drugs targeted at epithelial growth factor receptors (EGFRs) , are effective for a limited period and/or in a limited population and then resistance develops. Screens using RNAi or with genomics and proteomics identify proteins that are up- or down-regulated or are necessary for drug action in resistant cell populations. The receptor tyrosine kinase c-MET has recently been implicated in resistance to EGFR-targeted therapies and, on the basis of these discoveries, therapies directed against c-MET are in development . In order to understand better the convergence of signals from these two receptors, the tyrosine signaling networks of several cancer cell lines that overexpress c-MET or EGFR or express a mutant form of EGFR were examined to identify a core network of 50 proteins mediating drug response . This type of network analysis can form the basis for the selection of drugs that target the proteins common to both pathways and thus overcome drug-induced resistance. Genome medicine and systems pharmacology need to be integrated for defining the genes and proteins involved in drug treatment or drug resistance. Such integrated analyses can lead to identification of targets that are likely to synergize with or add to the effect of the drug or therapy. For example, studies focused on defining the genes involved in radiation therapy aim to discover new targets that would increase the effectiveness of radiation therapy [66, 67]. In fact, many drugs are prescribed in combination with other drugs, because the effectiveness of both drugs is increased when they are combined. Predicting which combinations will show this effect, and the doses of such combinations, is not entirely intuitive or simple. Sometimes, serendipitous results from genomic or proteomic screens identify targets that might have synergistic effects in conjunction with commonly used therapies, such as ceramide transport protein in taxane-based therapy . In proactive approaches, network analysis  or computational modeling  can provide information on the effect of intracellular signaling on inhibition of the two nodes, predicting how dosing with pairs or groups of drugs that target different proteins would work. Such a model was used to predict combination therapies in the EGFR pathway . These types of study can also be used to look for ways to lower dosages while sustaining effectiveness, avoiding unnecessary drug toxicity. Adverse events from drugs are a major concern in the development and prescription of pharmaceuticals. The susceptibility and severity of adverse events can vary tremendously between patients as a result of, among other confounders, genomic factors. At the simplest level, adverse events can be due to dosage effects of the drug. Pharmacogenomic factors affecting drug metabolism can lead to increased levels of active drug in the body. For drugs such as warfarin, which acts as an anticoagulant, too high a blood level owing to reduced metabolism (resulting from variant CYPs) can lead to uncontrolled bleeding and cerebral hemorrhage . For patients with CYPs that have lower warfarin metabolizing capabilities, the dosage of warfarin needs to be reduced so as to obtain its therapeutic benefits without increasing the risk of adverse events. Genetic factors can affect how patients respond to therapeutic doses of a drug. Patients with a deficiency in glucose 6-phosphatase dehydrogenase (G6PD) cannot respond sufficiently to multiple forms of oxidative stress and, thus, many drugs, including many anti-malarials, analgesics and antibiotics, can cause these patients to develop hemolytic anemia . Adverse events can also be modulated by the immune system, whereby the patient's immune system responds to the drug, leading to damage of otherwise healthy cells. For example, this can lead to drug-induced neutropenia . Several of this class of adverse event have been associated genetically with specific HLA alleles, the genes that control presentation of immunogenic epitopes . Drug-induced cardiac arrhythmias comprise another important class of side-effects. One example, the long QT syndrome, has been extensively studied because it can in many cases lead to fatal arrhythmias. Increased understanding of a congenital form of the syndrome, the frequency of the side-effect and the variability in its severity has led researchers to suggest that individual variability in cardiac repolarization reserve is among the major risk modifiers . Cardiac repolarization reserve is the capability of cells to compensate for changes in ion channel function that underlie the normal myocyte action potential. Thus, understanding how drugs regulate specific ion channels to modulate electrical interactions between channels to produce a physiological event is critical. This type of adverse event, which reflects an interaction between a drug and a complex biological system, is where systems pharmacology will prove most effective. Systems pharmacology projects have begun to identify targets that are important for causing the side-effect by grouping drugs according to their side-effect profiles . In addition, large-scale studies have begun to identify cellular modules that are important for causing the side-effects. For example, a large-scale study of mitochondrial function identified mitochondrial expression profiles affected by drugs that can cause drug-induced myopathies . Both genome medicine and systems pharmacology, as interdisciplinary research fields, are in their infancy. The convergent goals of both fields are to treat disease in each patient on the basis of the patient's genome and their unique environmental interactions. Thus, they can be considered to be the twin pillars supporting the gateway to personalized medicine. In both fields, there are considerable opportunities for new conceptual and technological developments. Success in personalized medicine will require advances in technology and concepts in both fields to be well integrated. The most influential driver for this integration is a mechanism-based understanding of disease and therapy across scales of biological organization. As a multi-scale understanding of the human body develops, it is likely to influence not only the treatment and prevention of disease, but also the economics and social aspects of health care. This work was supported by the NIH grants GM54508 and New York Systems Biology Center grant P50-GM071558. SB is supported by pre-doctoral training grant in Pharmacological Sciences GM-062754. We thank Avi Ma'ayan and Emmanuel Landau for comments.